Large scale land appropriation is very common in Sri Lanka. Land grabbing activities are carried on by local and international investors for different purposes (intensive monoculture, mines, tourist infrastructures). In Badulla district in Uva province, 628 acres of land have been grabbed from the Soragune forest in order to build a 36 hole Golf Course and a 1500 room hotel. The area was in the custody of the Soragune Shrine (“Kuda Katharagama Devala”). The site is a main catchment area of the Weli Oya Irrigation Scheme and is an important dwelling place of the elephants of the Udawalawa National Park. The downstream area is agricultural and more than 90% of the population is directly or indirectly linked with agriculture. Among the farmers 82% are cultivating paddy and they are highly dependent on the irrigated water of Weli Oya. The villagers living in the area are strongly linked with the forest resources as well. Non-timber forest products are used without harming the biodiversity of the forest and most of the uses concern harvesting of medicines, mushrooms, bee honey and firewood. According to the Golf course developer the major objective of the project is to attract more tourists for the country and to increase the income of the tourism sector. The project also aims to improve infrastructure facilities including road and communication networks for easy access by tourists . On the other hand several Environmental Justice Organisations and the local communities complain that the implementation of the project will bring environmental, economic, social and cultural destructions, which are closely linked with each other. The hotel and golf course are to be built in a 628-acre extent of land located in the Weli Oya water catchment and if completed would have adverse impacts on farmers in the Moneragala Districts dependent from that water stream for irrigation and therefore for their livelihood. The area is also rich in biodiversity and that an endemic plant, Uva Mandora, is found in the area. The land marked for the hotel project is also said to block the elephant corridor between the Uda Walawa National Park and proposed Bogahapattiya sanctuary. The corridor closure forces the elephants to pass through the nearby villages, creating a conflict between the elephants and the local communities. Objections have been raised by environmentalists and authorities, including the Irrigation Department and the CEA, against the proposed hotel and golf course project. Environmental justice organisations and local actors claim lack of transparency in the clearance of the land. According to Gazette Notification bearing No.772/22 published under the provisions of the National Environmental Act No. 47 of 1980 and its amendments, for any non-forest use developmental project carried out within an area of more than one hectare, prior written environmental recommendation should be obtained subject to the environment impact assessment (EIA) process. According to the National Environmental Act the proponent of the project should submit an Initial Environment Examination (IEE) or an EIA report relating the proposed project and to obtain approval for the implementation of the project. After that, newspaper advertisement should be published and must invite public comments. But even without the approval of CEA, trees have been marked for felling and a fence and a street have been constructed. Local communities of Welioya and Soragune, Centre for Environmental Justice, Sri Lanka Environmental Congress, Engaged Buddhist Solidarity for Nature have launched a Dharma Yathra started at Vihara Maha Devi park in Colombo on the 27th February 2014 which reached the Forest on the 1st March 2014. Over 60 buddhist monks and more than 4000 people joined the demonstration. The Dharmayathra started and run out ordain trees to stress the need to protect the Soragune forest. 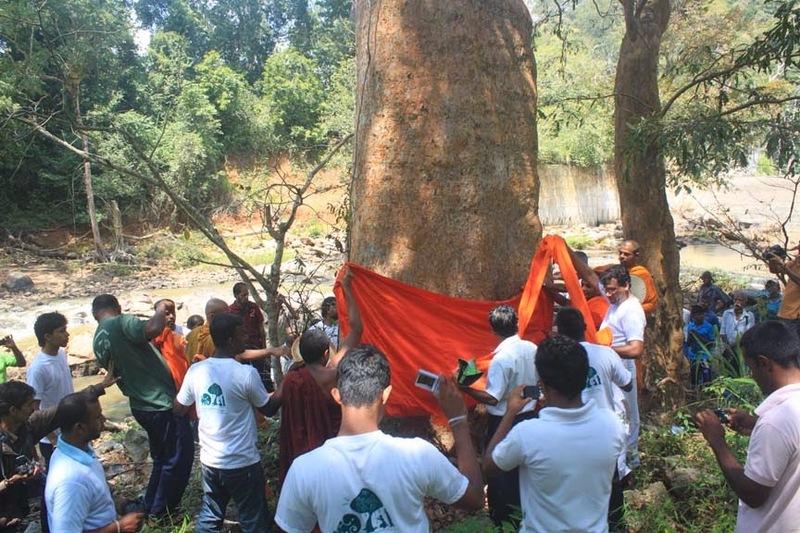 DHARMA YATRA: A Dharma Yathra started at Vihara Maha Devi park on the 27th February 2014 which reached the Forest on the 1st March 2014 for the ordination of the trees. Over 60 buddhist monks and more than 4000 people joined. 2. The land marked for the hotel project blocks the elephant corridor between the Uda Walawa National Park and Bogahapittiya sanctuary. If the project proceeds, the elephants would be forced to enter villages resulting in a massive human-elephant conflict. 3. It is prime forest territory, with savannah grasslands inhabited by elephant, bear, sambhur, and other animals. Precious tropical deciduous forestland in Bogahapattiya is threatened by developers. If the golf course project go through, Sri Lanka will lose considerable area of an extremely biodiverse forest. 4. Loss of vegetation caused by deforestation leads to soil erosion and run-off. The silted water ends up in the Weli Oya reservoir, which irrigates more than 3,000 acres of paddy land and feeds 27 small tanks. 5. The forest feeds two streams that enter the Weli Oya, which in turn feeds into the Walawe. After implementing the project these streams will dry off, creating a huge water problem in the area. The entire area is a hugely important watershed for populations downstream. The land selected for the golf course comes right up to where the two streams, including the Demata Ara, join up with the Weli Oya at a small dam. Construction work on the intended golf course will disrupt the Weli Oya irrigation system. Thousands of families depend on agriculture based on the waters of the Weli Oya. 6. In order to maintain the golf course in good condition, water and the fertilizer urea as well as pesticides should be used in large quantities. Aluminum compounds should be applied to the field in order to enhance binding of soil particles and prevent soil erosion. These chemicals will finally accumulate in the tanks irrigated by the Weli Oya Irrigation Project. That will be harmful to existing faunal and floral diversity. 7. An extensive study has been carried out on the vertebrate diversity of the Bogahapattiya-Soragune-Samanala Wewa Forest Area by Mr. L.J. Mendis Wickramasinghe of the Herpetological Foundation of Sri Lanka. The unpublished report, ‘A Vertebrate Faunal Survey of Samanala Wewa, Towards Declaration as a Wildlife National Park’ identifies around 390 species from 5 vertebrate families. Out of that, 59 are endemic to Sri Lanka. Around 40% of the total number of vertebrate species and 19% of the endemic vertebrate species in the country are found in the area, according to the report. A number of extremely rare species and also several new species have been recorded from the forest. Other Chemicals needed for the mantain of the Golf course in good condition will accumulate in the tanks irrigated by the Weli Oya Irrigation Project. Contamination of these tanks causes serious health problems in the community that depends on these tanks for their water requirements. There is a threat of skin diseases and cancer due to the intensive use of pesticides and other agro-chemicals for the management of golf ground. web site: Environment Conservation Trust. Article: Dumbara Forest are we going to keep it?